SETTLEMENT, Anegada, VI – Determined to put up a strong fight to secure their livelihood fishermen on Anegada have come together as a group to protest attempts by the Government which would see them ceasing fishing activities in certain locations. This news site was hit by a flurry of calls from fishermen who are and are not members of the newly formed group as they raged about the impending decision of the Ministry of Natural Resources and Labour to cut off certain fishing activities around the island. This was all fueled by a public notice which emanated from the National Park Trust, a copy of which was forwarded to this news site by those concerned. 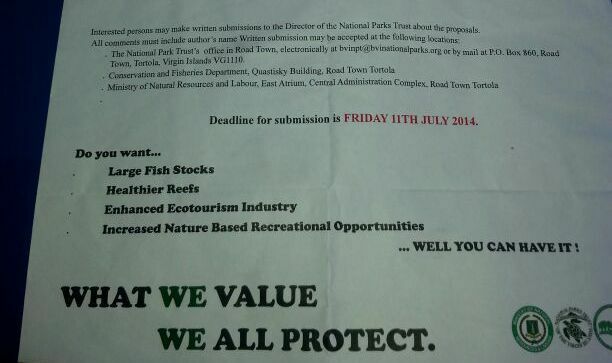 The flyer highlighted three areas which the Government proposes to put under the National Park Trust and would essentially prohibit fishing activities in those areas. But according to one of the fishermen in Anegada, “That is not going to happen over our dead bodies, look what they had done at Virgin Gorda some years ago." Another said that it was during a meeting that it was revealed to them that the government has already started to lease lands for a lifetime to certain people as in the case of the owner of the Anegada Beach Club. 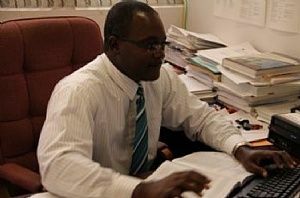 Another, Mr Gregory A. Levons Snr, who the group has selected as their leader and spokesman, was also very candid in his views of the alleged move by government. “If you look at Virgin Gorda from the Bath straight up to the Marina, there was National Park and look what happening today, [foreigners] have taken it over,” he said, adding that this is what he fears may happen in Anegada. Mr Levons Snr said that the areas that are being earmarked by government to be placed under the National Park Trust are the breadbasket for fishermen all across the Territory. “Fishermen from Anegada, Virgin Gorda, Jost Van Dyke and Tortola fish in those areas, it’s the breadbasket for the fishermen of this Territory; now when you cut us off from fishing in those area what are we to do, this nonsense will not happen,” insisted Mr Levons Snr. Asked how they become knowledgeable about the attempted move by government they said that it was leaked to them shortly before a deadline that was set for the submission of suggestions. The notice as seen by this news site clearly indicates that interested persons had until July 11, 2014 to submit their suggestions and/or proposals. Contacted by this news site Permanent Secretary within the Ministry of Natural Resources and Labour Mr Ronald F. Smith-Berkeley said that there is no need for the fishermen to be panicking as he said that plans are afoot to hold a string of community meetings with those concerned on the sister islands. He said that there are indeed some areas that are being proposed to put under the National Park Trust, “but it’s not a decided move its only a proposal which we have to and will be taking to the people for their input before any final decision can be made,” said the Permanent Secretary. 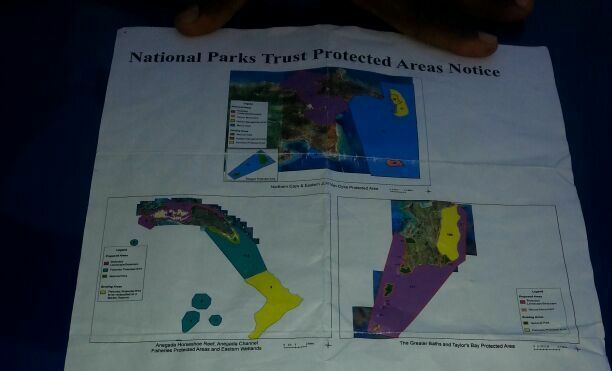 He did say that the notice was put out but persons may have misinterpreted as he also said that he has been advised of persons going into the National Park Trust seeking further information and voicing their concerns. “I understand that a number of persons have already sent in suggestions and proposals so persons have been responding by writing but we are actively making plans to go into those communities to meet with the residents,” said Mr Smith-Berkeley. When this information was conveyed to the concerned residents this news site was told that they will not be fooled as they strongly believe that it was as a consequence of them creating a stir about the issue that the Conservation and Fisheries, National Park Trust and the Ministry of Natural Resources have decided on holding the community meetings. “We are not buying that… if we didn’t shout they would not have made such hurry up decision to decide to come for meeting with us, don’t be fooled because we are standing our grounds on this one.” said one fisherman. Don't be a idiot, if you read the notice... that is printed... it has nothing to do with SELLING OUT... in fact it is the opposite. Gov is protecting the land and sea from everybody... people here acting like government taking ALLLL the sea away... it is a piece that they trying to protect.... THE FISh must spill over... into the unprotected area. You must be an a-hole to think that the governor is protecting the land. Protecting the land for who? Governing is not ruling. You can't make cultural changes overnight that is a basic understanding of politics. And what is the motive behind this agenda? Who's motive? And do they prefer that we import more fish? You can't do what you want to do then tell people it's for/helping them. The NDP really doing there best to sell out the territory 175 acres for 199 years that is criminal and not hardly a word to the public. They probably leased it pennies on the dollar and its going to cost millions to get back. Just wow. A Sept 1911 article in Beacon introduces the new owner of the beach club as a belonger, developer behind Mooney Bay Estate, Nail Bay Estates and Resort.- According to the paper, which anyone can google, he wants to "aggressively" expand his brand in the territory over the next 10 yrs as well as in St Vincent and Grenadines. Given this background, My radar was up on his intentions and his expansion. The question is HOW given Anegada's character. His developing is not as simple as it sounds and those who are not paying attention are asleep at the switch. Upscale living is oozing from North Sound to Anegada, one of the last natural places. 99 yr least is long enough. with little regulations and oversight, 199 yrs is too long. The original ABC was a 16 room Sands Hotel. Much like the original Oil Nut Bay. Now it is up to how many rooms? The Government should have been stricter on this development, but then again, resort pressure is on... and natural balance is off. well you all have not heard what happen to JVD wait until the fat hit the fan. Some JVD had to scramble to purchase land as 1/2 JVD is sold to the white man ok!!!!!!!!!!!!!!!!!!! Last I heard, the white man foreigner who owns ABC is a BV Islander, just like you. Surely, whats good for the goose is good for the gander. Is he truly a BVIslander, or one of the quisling BVIslander the NDP recently invented when they decide to give passports out like candy to all their foreign friends? Anegada belongs to Anegadians. The only way other bvislanders can get land on Anegada is for an Anegadians to sell it to them and only after a period of seven years once deeded. Know your facts before you post. This was definitely not the case here. When are we going to march on these people and declare a no confident government! NDP going to starve us because them want to ban certian types of fishing and them dont want to finish the green houses. If we have to march like Theadolph Faulkner and Landon Fonseca and rest of the good men of our Virgin Islands who march for our BVI.Now our NDP Government is selling our islands again.This is just not about anegadians black nor white but the whole BVI.Restaurant,hotels supermarkets and we the people soon can't buy local seafood no more.We will have to buy imported sea food.3-6 months old from other foreign countries which is more expensive.And its right here fresh in the BVI and cheaper. I have to wonder about the protocol for entering into such long term leases? Another reason why ndp must go! Check the facts? There is no such lease! Get the facts!!! One of the things that everyone in BVIslander needs to understand is that the BVI is not a sovereign state. We do not have financial independence and need to understand that it is the people that pay the bills that make the decisions. Actually, no. It is the mother country that makes the decisions. It is the greedy local politicians that undermine those decision to line their greedy pockets at the cost of our future. also the voters need to apologised to those affected by having the NDP in power.